Lacquered Geek: Nerd Lacquer Spam! Hey there! I hope you all had a great weekend. Mine was busy, busy, busy, and I'm not ready for it to be Monday! 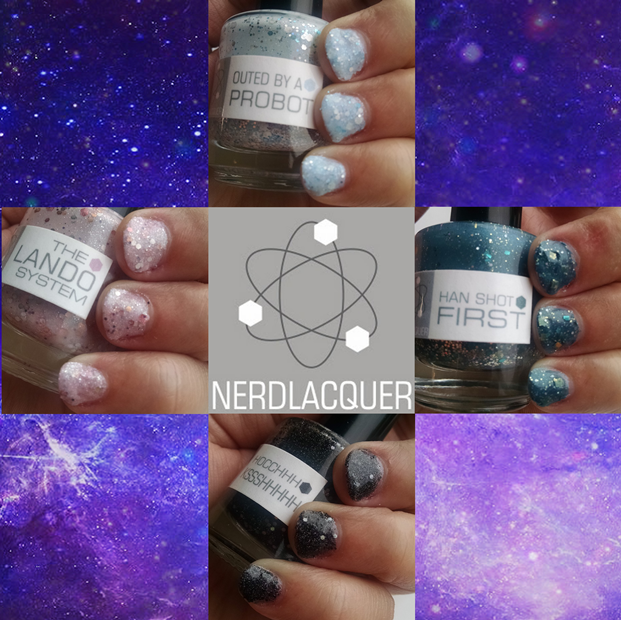 On Friday, polish lovers were surprised with an unannounced restock from one of the most allusive makers - Nerd Lacquer. By the time I found out about the restock, almost everything was sold. I was able to get one that I'd been checking destrash sales for. Since I'm really hoping that she's back for good this time, I'm bringing you a few of my favorite Nerds that are based on Star Wars. First let me that Nerds will settle; every Nerd I own has significant settling. I let these sit upside down for about an hour before I using them to get the glitters mixed in. The formulas on all of these was very consistent. I did 3 thin coats of each on their own (sans undies). They are true glitter bombs, and there's no problems getting glitters out of the bottle (once you have them well mixed) I used Yellow Stopper to make removal easier. Now that's out of the way, let's get to these lovelies. First I have The Lando System which is inspired by Cloud City. It's a soft pink base full of silver, pink, and black glitters. I have seen some photos with a more purple base, but my version is pink. I love it! Hocchhh Kssshhhhh is probably the most fun polish name to say ever! Go ahead, say it!! It's inspired by the big baddie himself, Darth Vader. It is a very sheer black that's full of silver and various shaped black glitters, and silver micro shimmer. I've typically worn this over a black base, but I wanted to see what it looked like on its own. I like it much better on its own; the micro shimmer is much more noticeable. Last, but definitely not least is Han Shot First. It's a dusty teal with small turquoise and gold glitters, and big gold squares. 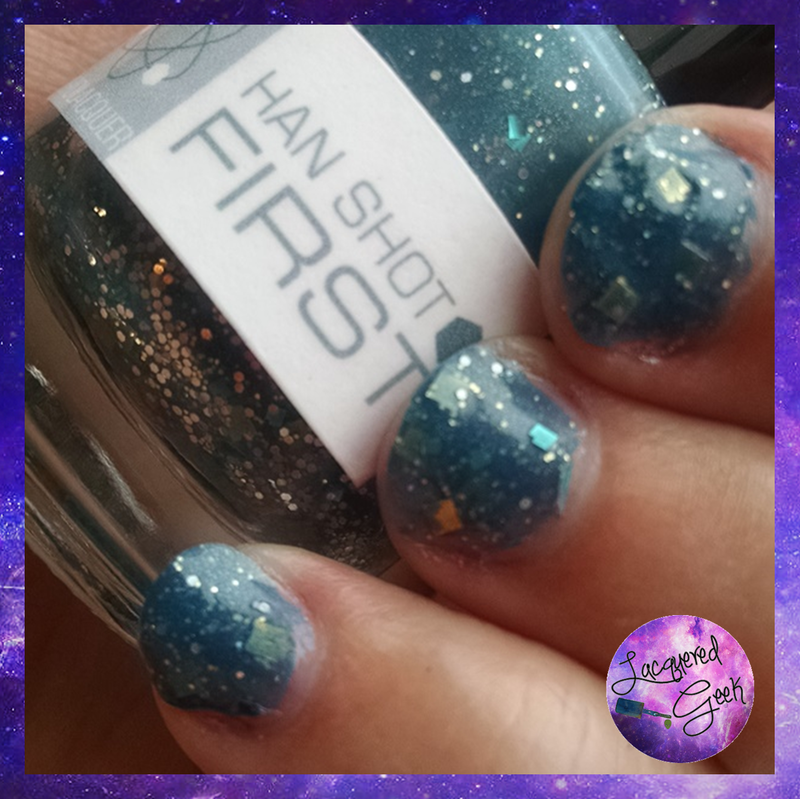 Whereas the other 3 polishes were all restocked on Friday, the only way to get Han Shot First is through blog/destash sales. 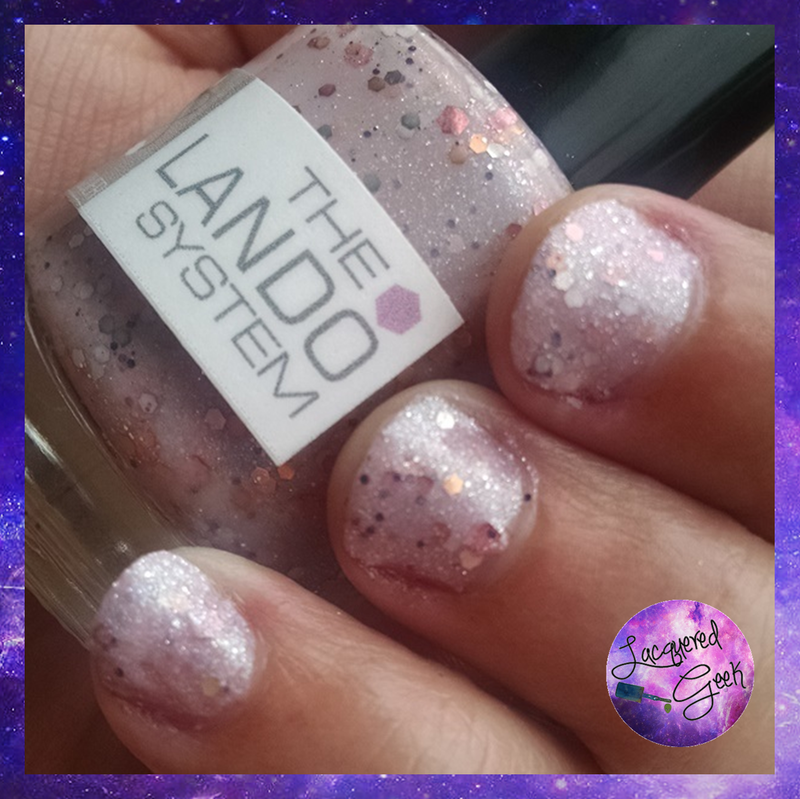 It was one of the 3 exclusive polishes that Nerd Lacquer made for Harlow & Co. I wanted this polish from the very first time I saw it, and constantly checked destash sales for it. I finally got it, and let me say, it was worth every minute spent looking for it!! 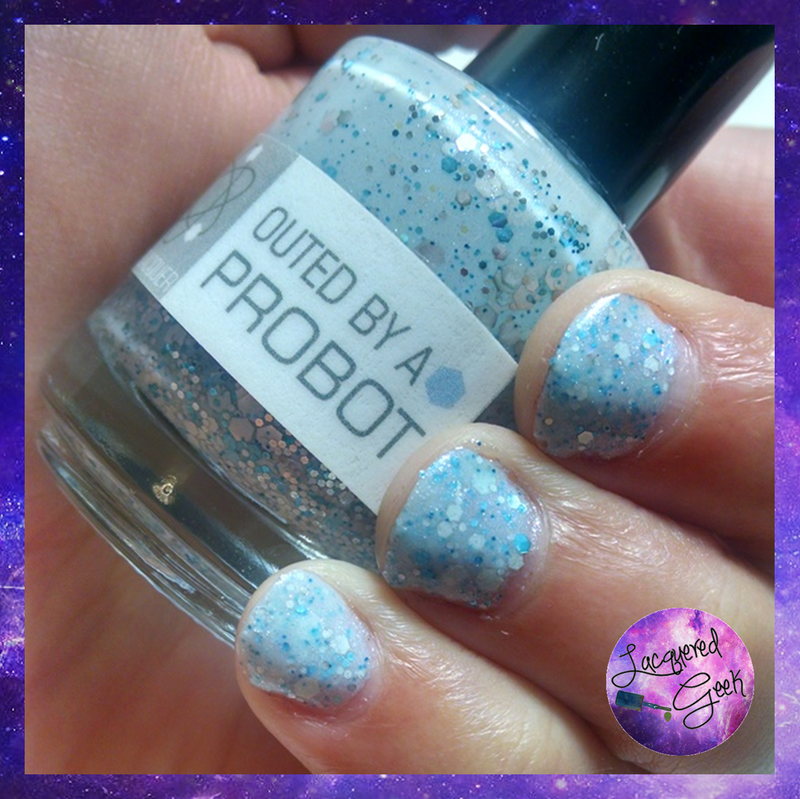 Nerd Lacquers are some of my favorite glitter bombs. Yes, there are many other indie makers out there that have polishes that are just as good, and no, Nerds are not easy to find because she disappears fairly often, and even when she is around, she doesn't announce her restocks very well. But, for me, that's part of the allure... scoring that one polish that you've been eyeing! You can follow her Google+ page - she used to post regularly but there's been nothing since December, or you can just randomly check her shop. How do you hear about these secret restocks? I've heard of 2-3 of these in the past year but never seem to hear of them until it's too late. I follow on Google Plus, Facebook, etc. What gives!? I found out about this one through a Facebook group. Sadly, I didn't check Facebook until 2 hours after the restock went live.